It’s true, I come with a lot of baggage. Mostly in the form of gum wrappers, lip gloss and receipts from last year. Having a trusty handbag to hold all of those precious belongings [also read, trash] is crucial. Like every one of you, I can’t leave home without a handbag attached to my side. And by attached to my side I mean strapped over my shoulder or arm [details]. I am not a huge swapper out of purses often, however, I do like to have a different bag for different events and purpose – mostly between travel, everyday use, office use, date nights and fancy events and long days out and about. I always turn to Sole Society for reasonably priced, cute and durable bags. I got hooked on Sole Society a year or two ago when I picked up my first travel weekender bag. I have since added several more to my collection [they are seriously the best for either carry on bags or weekends away!] 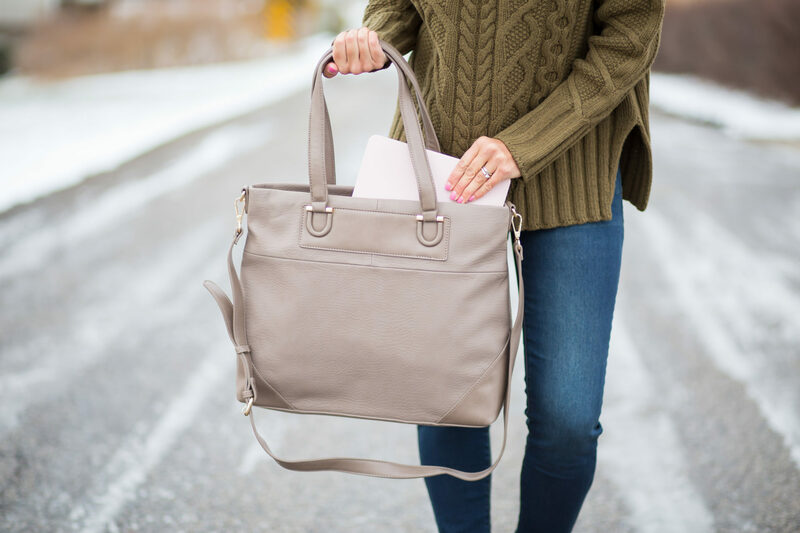 With their new arrivals out, I thought it would be fun to highlight my top 5 bags for every life situation, the best part – they are all under $100 and waiting for you to grab ahold and go! First up, for everyday use, the Vegan Zippered Satchel. The outside zipper detail gives this bag the perfect amount of pizazz and the size is absolutely perfect for holding just enough but not large enough to be overbearing. Available in 3 great classic colors and less than $70, this bag is oh so suitable for all of your everyday uses. Bonus – it does come with a strap that can be used for a crossbody purpose! 2. Next up, for all of your winter travels – the Vegan Woven Weekender. This bag is all sorts of heart eyes. I am in love with the woven detail as it looks so classy and sharp while on the go. This bag holds a heck of a lot making your travel days and weekends away a breeze. I recently took this to Chicago and was able to fit several outfits, toiletries and two pairs of shoes inside! A shoulder strap is also included to make things even easier as you run through the airport to catch your flight to better yet, to Chipotle for flying fuel. 5. And last but not least, the bag that saves your arms and hands from it all on those busy days on the go, the Vegan Flapover Crossbody. There is nothing I love more than a great crossbody bag. The freedom that they give you is similar to the feeling that I get when I drop the dogs off at the groomer for four hours. It’s really like I want to run around in circles and eat ice cream just because I can. 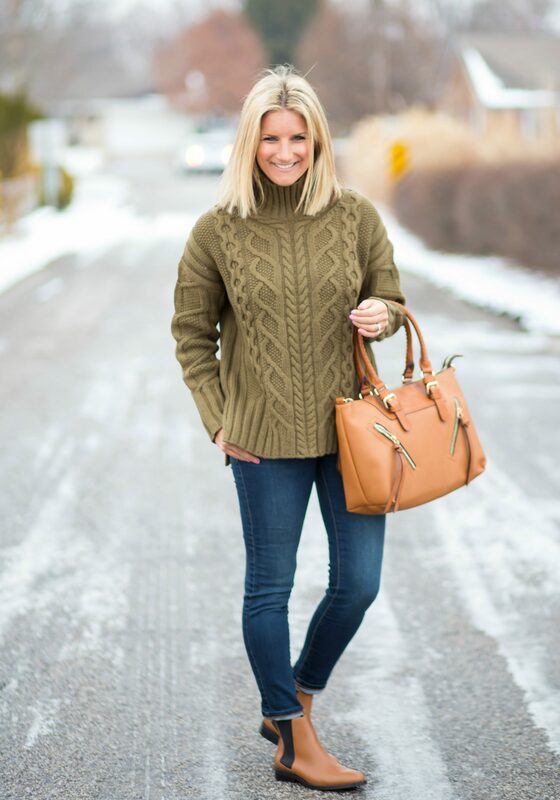 This crossbody bag looks so rich to me, yet is less than $60 and again – the perfect size! Fun fact – that outside zipper pouch could hold some things if you’d like. Remember those gum wrappers I mentioned earlier? Perfect hiding spot. Alright party people now is the time when you get your booties over to Sole Society and feast your eyes on all that you saw here today. Curious though, which bag is your favorite? Drop it in the comments below! Disclosure: Thank you Sole Society for sponsoring today’s post. I love your blog. Erin, where did you get the black tunic in this post ? I love it! Thank you so much!! That tunic is Pleione brand from Nordstrom (I love it)! So torn between the satchel and the crossbody! One of them will come to live with me once I decide which one I like best. Maybe both! Love all of these purses, Erin. Question on the ‘Deb’ Vegan Tote, is the color in your picture Taupe that they show on the website? Just looks a little darker than the picture. Thanks for being so helpful and amazing!! Yes, it is the taupe! It could be the lighting in the photo? Love these bags! Where did you get the shoes you’re wearing in the picture with the weekender bag?